There is neither a memorial nor historical marker. The disposition of the remains of nearly all that perished are unknown or unmarked. In fact, the number of dead resulting from the disaster is not known with absolute certainty. Yet, the head-on collision that occurred at Woodville, Indiana, ranks as one the most deadly railroad wrecks in American history. It remains Porter County's worst disaster. following the collision at Woodville, Porter County, Indiana. Source: The Nashville American, November 13, 1906.
took place approximately 300 feet past the building visible at far right. Source: Collection of Mike Fleming. Woodville is located in Porter County's Liberty Township. One traveling today along County Road 900 North between Meridian Road and Old Indiana State Road 49 would be oblivious to the fact that they are passing through the former community of Woodville or the site of human misery where hundreds of people gathered during the early morning hours of November 12, 1906, to fight an intense blaze, search through wreckage, assist the large number of injured, or simply look dumbstruck upon an incredible wreck. No signage exists marking the location of this now lost community. located in Liberty Township, Porter County, Indiana. Source: George A. Ogle and Company, 1906, p. 15. The Baltimore & Ohio Railroad (B&O) had laid 16½ miles of track through Porter County by 1874. These tracks have traversed the same location in the county for more than 140 years. Today, the rail line is owned and operated by CSX Transportation. During the era of steam powered locomotives, numerous small villages dotted American rail lines. Locomotives needed a ready stock of water and fuel, either wood or coal, which necessitated the construction of a string of supply depots about every three to ten miles along the rail line. 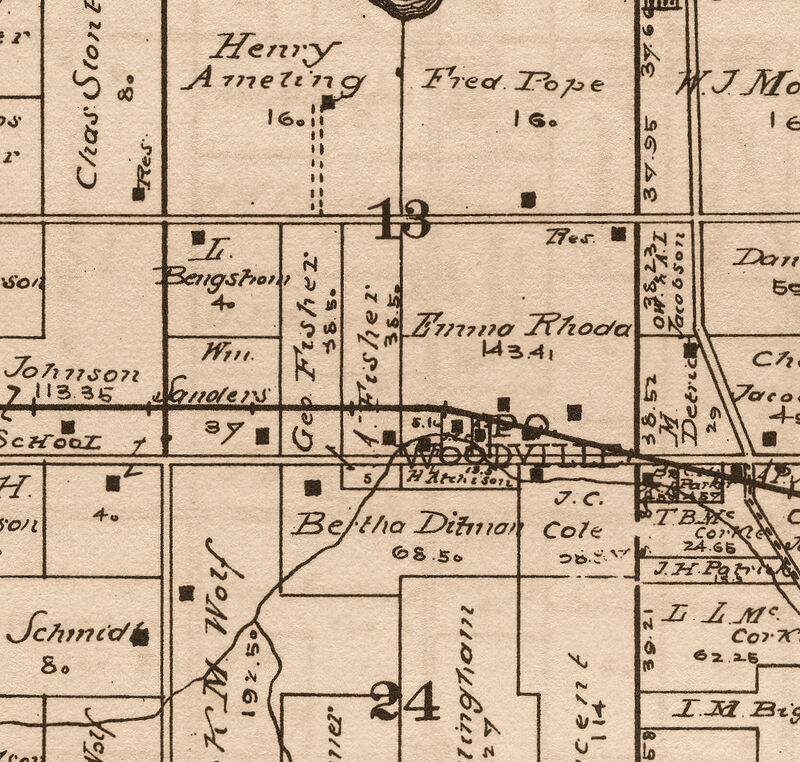 In Liberty Township, supply depots were erected by the B&O at Babcock (also referred to as Babcock Station) and Woodville, while to the east in Jackson Township a depot was established at Suman, which was also referred to as Thelma. Exiting Jackson Township, a B&O train could next stop for water and fuel at Coburg in Washington Township. Initially, the depot at Woodville was to be named Spring Hill Station, a name chosen by Thomas Richard Johnson. 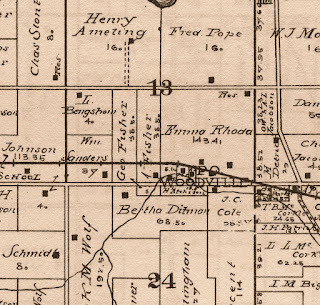 Johnson had offered to donate a portion of his land for a B&O depot in December 1874; the B&O declined Johnson's offer and instead constructed its first depot in the area at Suman in Jackson Township. 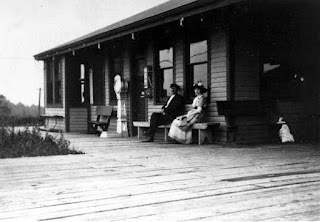 Soon after the Suman depot was completed, however, a depot was established where Johnson's Spring Hill Station was to be located. The station was named Woodville rather than Spring Hill Station. 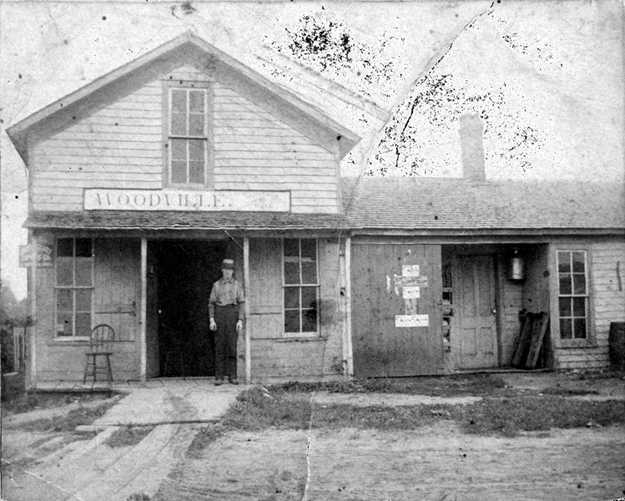 The origin of the name Woodville is unknown, but it is speculated that the depot was named in honor of William Woodville, a native of England who was appointed auditor of the B&O Railroad Company in February 1830 and soon after became the railroad's superintendent of transportation. Woodville would remain an executive with the company until his death on September 23, 1863. The site at Woodville was most likely chosen for a supply depot due to the abundant volume of timber growing in the area at the time of the B&O's construction of the line. Timber was cut here for both fuel and the production of crossties. When designing and constructing supply depots, the railroad company would typically include a siding, sometimes referred to as a sidetrack, so that other trains traveling the line could pass through if another train was taking on water, fuel, passengers, or freight. The B&O was no exception, it installed sidings when it constructed the Liberty Township depots at Babcock and Woodville. The siding at Babcock played a pivotal role in the collision that took place at Woodville. 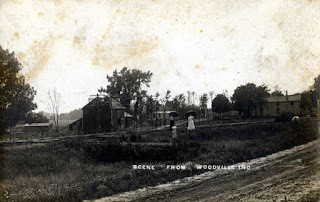 located at Woodville, Porter County, Indiana, circa 1910. Source: Collection of Tim Cole. B&O passenger train No. 47 began its westbound journey from Garrett, DeKalb County, Indiana, to Chicago very early in the morning on November 12, 1906. It was a common practice during this time period for trains to operate in two separate sections, and passenger train No. 47 was running in such a configuration. Engine No. 2130 pulled the first set of cars for passenger train No. 47, while engine No. 1459 pulled the second set of passenger cars; the second section followed a few miles behind the first section. The B&O had established safety regulations for trains traveling in sections. Specifically, the locomotive on the first section was required to display green flags, while two green lamp lights were to be visible at the rear of the train. These visual indicators would provide evidence to trains traveling in the opposite direction and idling on a siding that a second section was following behind. In addition, one long and two short blasts from the engine's whistle of the first section were required to be sounded when passing oncoming trains waiting on sidetracks. The train on the siding, upon hearing the whistle of the first section, was required to respond with a return whistle blast. If no response whistle was given, then the first section train on the mainline was mandated to stop to ensure that the train on the siding would not proceed onto the mainline. Thus, a train idling on a siding with crew that witnessed green lights and flagging and following the whistle signals could proceed onto the main line after the second section had passed. When the first section of passenger train No. 47 embarked from Garrett, the two green lamps were lit and green flagging was displayed. When the train arrived at Walkerton, about 35 miles east of Woodville, the section signals were still appropriately displayed on the lead engine. The weather during the early morning hours of November 12 was cold, windy, and very stormy; descriptive evidence suggests that heavy lake effect snow was falling throughout Northwest Indiana at the time. As a result visibility was very poor and audible signaling was increasing in its importance. General store and post office at Woodville, Porter County, Indiana. Meanwhile, freight train No. 98 was traveling eastbound on the B&O tracks. At 2:35 am, this freight train, which consisted of an engine, 31 cars, and a caboose, took to the siding at Babcock to allow westbound passenger train No. 47 to pass. The first section of passenger train No. 47 proceeded westward toward Chicago through Woodville and Babcock without stopping to take on additional passengers, fuel, or water. As it passed through Babcock at 2:45 am, traveling at 60 miles per hour, the freight train crew on the siding reported that it saw no green lamp lights at the rear of the passenger train. Snow was falling so heavily that the green flags on the passenger train's engine were not visible to the freight train crew. The freight train crew did report that the first section of the passenger train sounded its whistle as it passed, but it was understood by them to be a whistle for the road crossing at Babcock (today's County Road 200 West). In other words, the required whistle sequence to signal a second section of oncoming rail traffic was reportedly not given by the first section of passenger train No. 47. As a result, the freight train crew did not blast its whistle in response. Given B&O safety regulations, the passenger train should have stopped at Babcock to ascertain why the freight train crew failed to return its signal whistle. Thus, the disaster that would soon occur at Woodville was set into motion. The first section of passenger train No. 47 continued westward and stopped at the small Portage Township village of McCool, two miles west of Babcock, where it was discovered that the two green lamp lights were out. The engineer and fireman relit the green lamps, but they did not report to the operator at McCool that their engine's green lamp lights were out or that they failed to receive a whistle blast response from the freight engine that was idling on the siding at Babcock. Immediately after the first section of passenger train No. 47 traveled westbound through Babcock, freight train No. 98 pulled onto the mainline heading eastbound believing that no second section was following behind the passenger train. The second section of passenger train No. 47 was approximately five miles east of Woodville at this time and traveling directly toward the freight train. The second section of passenger train No. 47 was referred to as an emigrant train. It consisted of five cars of passengers that had recently arrived in the United States from Austria, Italy, Poland, and Serbian Russia; a baggage car and mail car were also attached to this train. A total of 167 paid passengers were on the second section of the passenger train, as well as numerous children under the age of five that rode free, the train's crew, and a few adult passengers traveling for free (referred to as "dead heads"). Most of the emigrants were traveling to areas in and around Chicago and Milwaukee to meet family and friends with the aspirations of settling into a new and productive life in America. Approximately 500 feet west of the present day railroad crossing of County Road 900 North at Woodville, at 3:06 am, the freight and passenger trains collided along a curve. Reports state that both trains were traveling at least 50 miles per hour when they encountered one another at Woodville. Charles Franklin Reneman, engineer of the second section of passenger train No. 47 was leaning out of his engine's window at the time of the accident; the force of the collision threw Reneman from his engine and clear of the wreckage. Though terribly battered and bruised, Reneman assisted in rescue work. How the wreck happened at Woodville, Indiana. Source: The Chicago Daily Tribune, November 13, 1906, p. 3. The smoldering wreckage at Woodville, Indiana. Source: The Chicago Daily Tribune, November 13, 1906, p. 2. Scene of the wreck at Woodville, Indiana. Source: The Inter Ocean, November 13, 1906, p. 3. 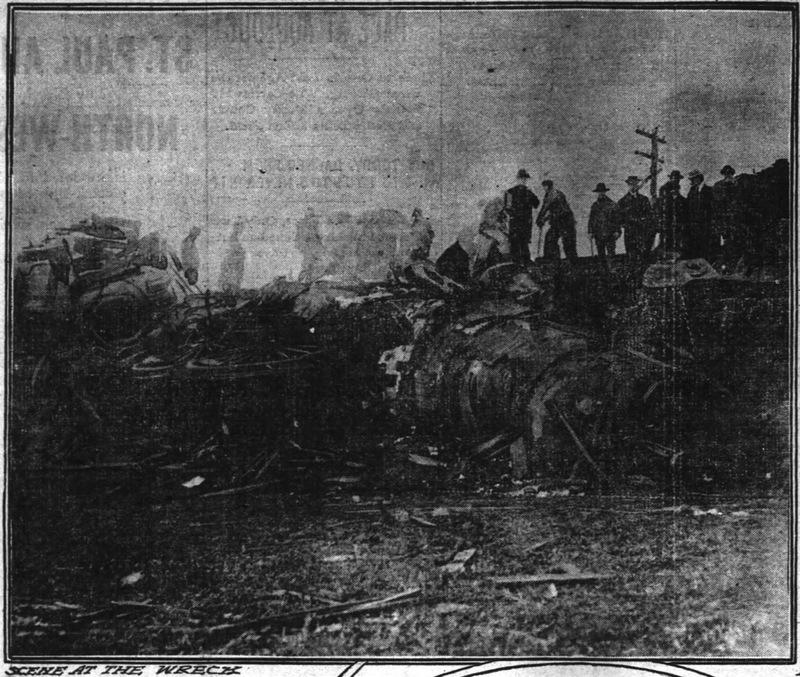 Locomotive and debris at Woodville, Indiana, train wreck. Source: The Chicago Daily Tribune, November 18, 1906, p. 8. Clearing the wreck from the tracks at Woodville, Indiana. The two trains came together on a sharp curve, and neither engineer knew of the impending danger until an instant before the crash.... The passenger cars were crushed as though they were egg shells. The sleeping passengers who did not meet death instantly, fought to get out of the death trap they found themselves in. Almost instantly after the crash flames shot up out of the debris, and continued the work of destruction. Many of the injured were pinioned under heavy timbers, and were slowly burned to death. No one knows how many died in that wreck. 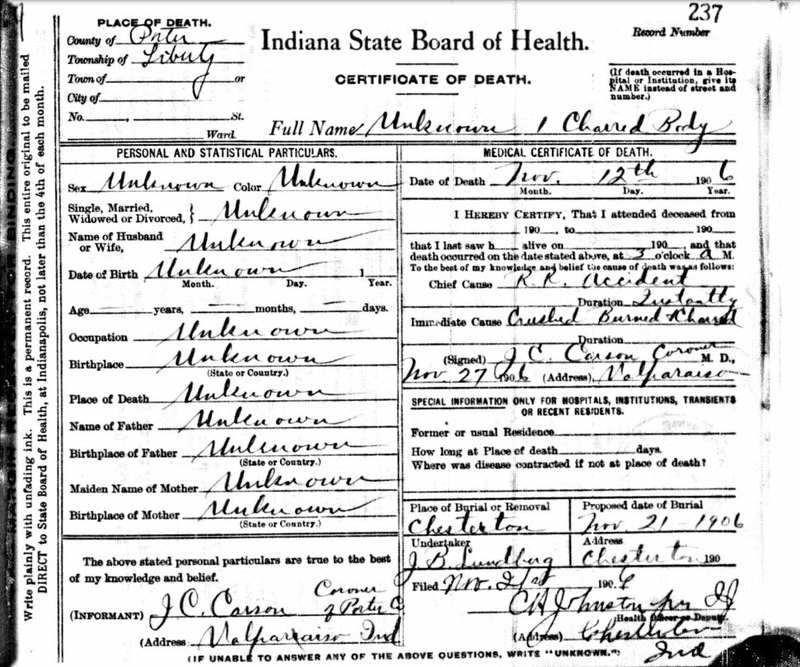 [Porter County] Coroner [Joseph C.] Carson says that the number will reach between sixty and seventy. Twelve bodies were brought to Chesterton by Undertaker [John B.] Lundberg. Ten of these were simply charred carcasses and beyond identification. The flames lit up the sky, and the screams of burning victims pierced the air. Then all was still. Death soon ended the awful sufferings, and the work of clearing the debris began. Undertaker Lundberg gathered up every fragment of human flesh about the wreck, waiting to complete the work until after all the debris was cleared up, and these charred remains constituted what he thought were ten human beings. These were placed in a large coffin and buried in the Catholic cemetery in Chesterton [St. Patrick's Cemetery]. The story that has been circulated that a trench was dug on the right of way at the scene of the wreck, and the bodies dumped into it, is false. The bodies of all the rest of the victims were reduced to ashes and were mixed with the ashes of the wreck, making it entirely impossible to collect them. The burning of the train destroyed an unknown number of human beings, and reduced their remains to ashes, leaving no trace to guide anyone in collecting them. The force of the collision was so great that the engines were telescoped, and with six coaches that made up the passenger train and several cars of the freight train, rolled down the twenty feet embankment into the ditch where they took fire and were consumed. 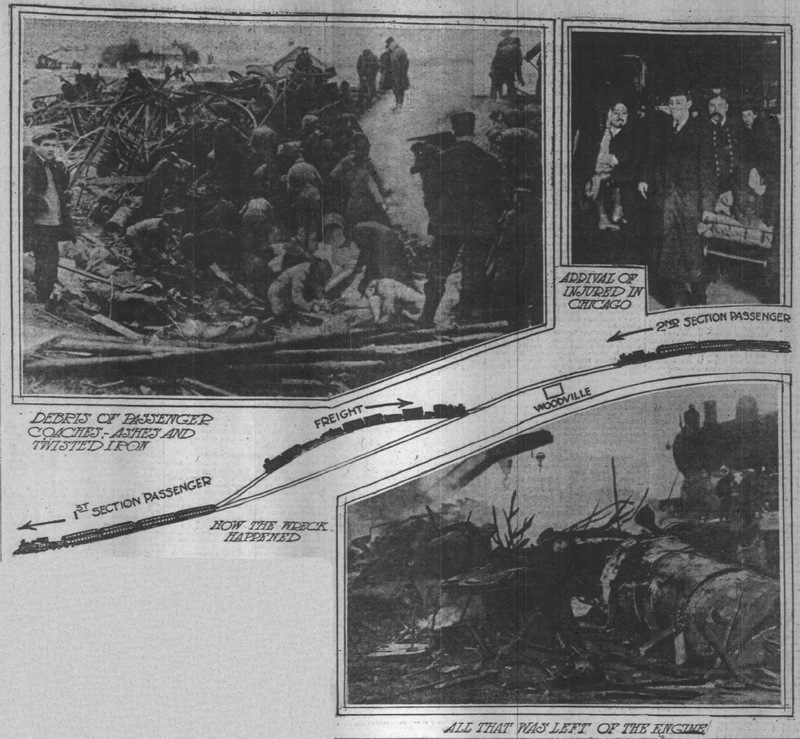 The dead and those pinioned down by the wreckage were incinerated, while as many as possible of the wounded were carried beyond the reach of the flames and given temporary aid until a relief train arrived, when they were brought to Chicago and taken to Mercy hospital. News of the Woodville wreck was rapidly reported both nationally and internationally. Headlines highlighting the number of dead and injured varied widely from one report to another. 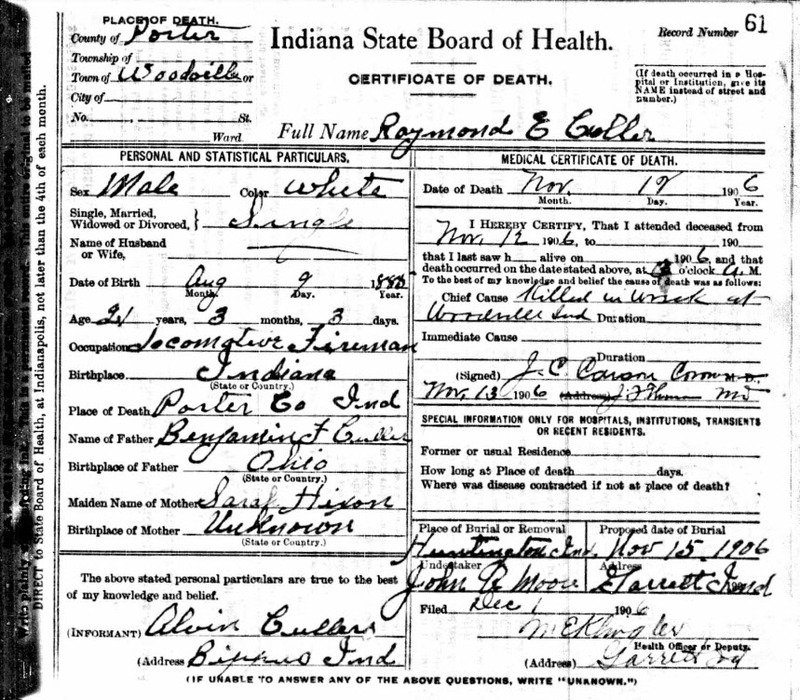 The official number of dead, as published in the investigation report prepared by the Railroad Commission of Indiana, was 44, with the number injured set at 150. The Commission's figures, however, likely underestimated the casualties. 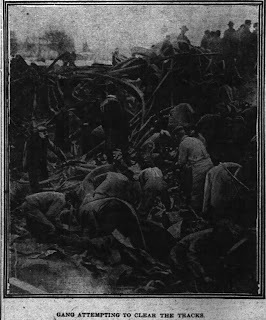 Local residents of the Woodville area, including Norman M. Ashton, Jonathan Biggs, Andrew J. Johnson, David E. Linderman, and Carl J. Rhoda assisted in rescue work at the scene of the wreck. All the neighboring homes in the area were instantly converted into pseudo hospitals to triage the victims before transport to Chicago. Headline announcing wreck at Woodville, Indiana. 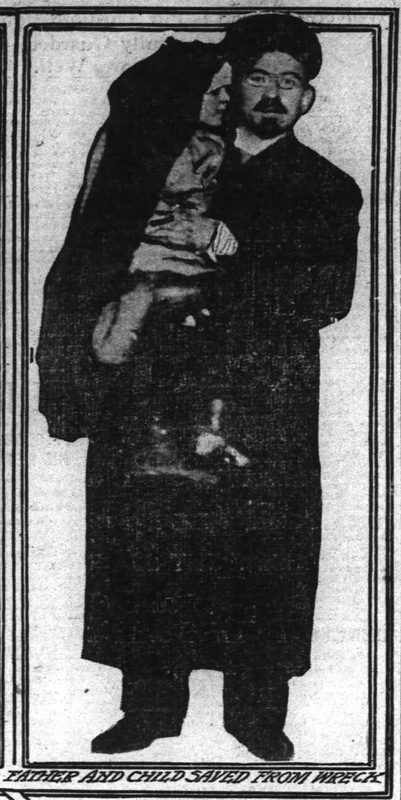 Source: The Buffalo Enquirer, November 12, 1906, p. 1. 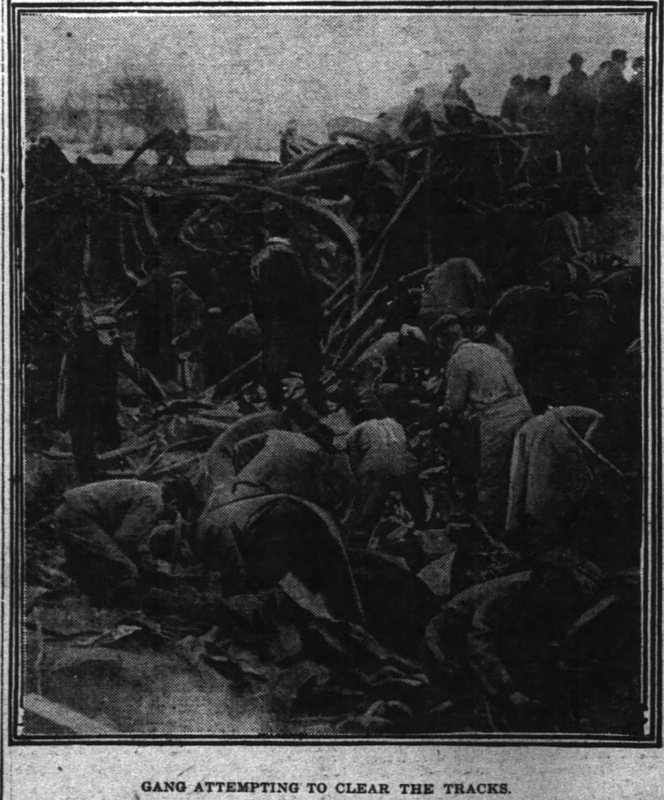 As pointed out in The Chesterton Tribune coverage of the incident, many bodies were completely incinerated by the flames of the wreckage; there were simply no remains to recover. 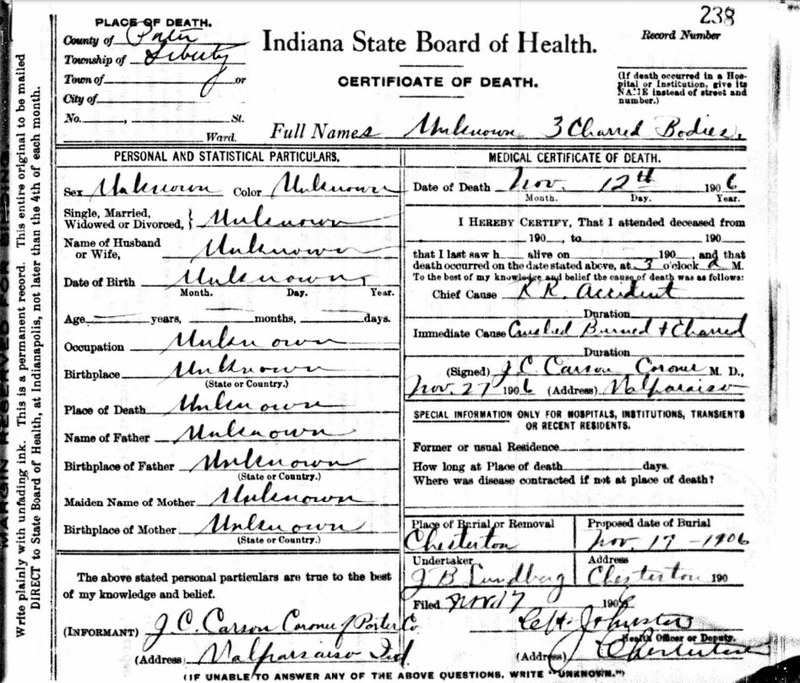 Porter County Coroner Carson at one point placed the official number of dead at between 85 and 100, which, if the low end of his estimate was correct, would have made the wreck the third deadliest in United States history at that time. The wreck would be the fourteenth deadliest rail accident if the official number of 44 was correct. Two other significant railroad disasters have taken place in Porter County. 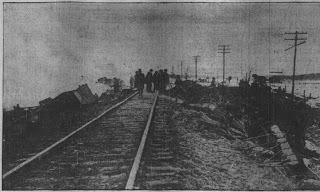 The wreck at Porter on February 27, 1921, killed 37, while the Chicago & Atlantic Railroad wreck west of Kouts on October 11, 1887, resulted in 9 to 11 deaths. 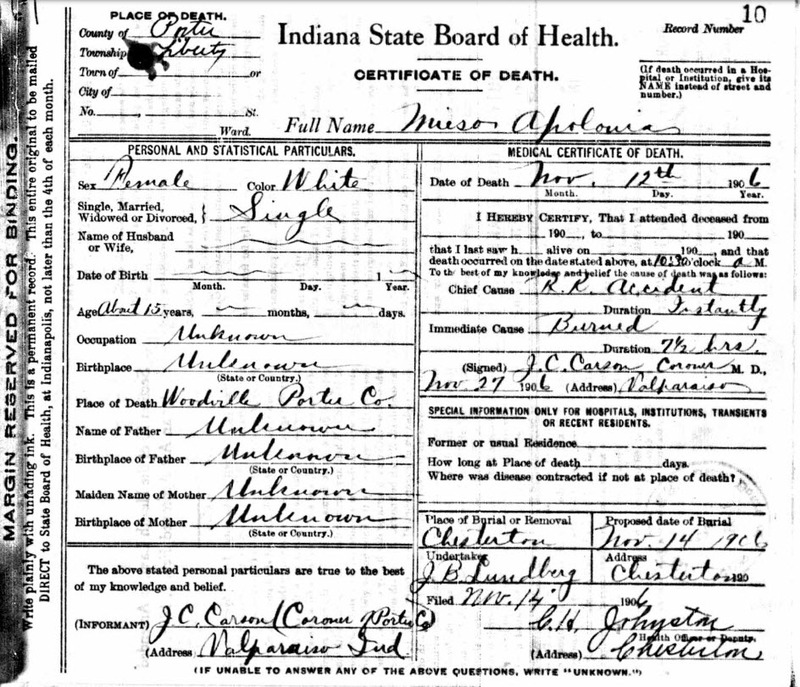 The vast difference in the official number of dead and Coroner Carson's estimate is due to the fact that many of the emigrants were traveling with children under the age of five years. Accounting for these children, who were neither ticketed nor enumerated on a passenger list, was impossible, and it was known with certainty that many children were never recovered from the scene of the wreck. Father and child saved from the wreck at Woodville, Indiana. Immigrant family that escaped injury from wreck at Woodville, Indiana. Ironically, exactly four years prior to this disaster, on November 11, 1902, at nearly the same location at Woodville, the second section of a B&O freight train collided into the rear of the freight train's first section resulting in the derailment of thirteen cars loaded with coal and coke. The first section of the train experienced a burst air hose resulting in its immediate standstill. The official cause of the accident, however, was not attributed to the air hose failure, rather it was blamed on the second section traveling too close to the first section. Had this train been carrying passengers, then this wreck, too, would have resulted in numerous deaths and injuries. 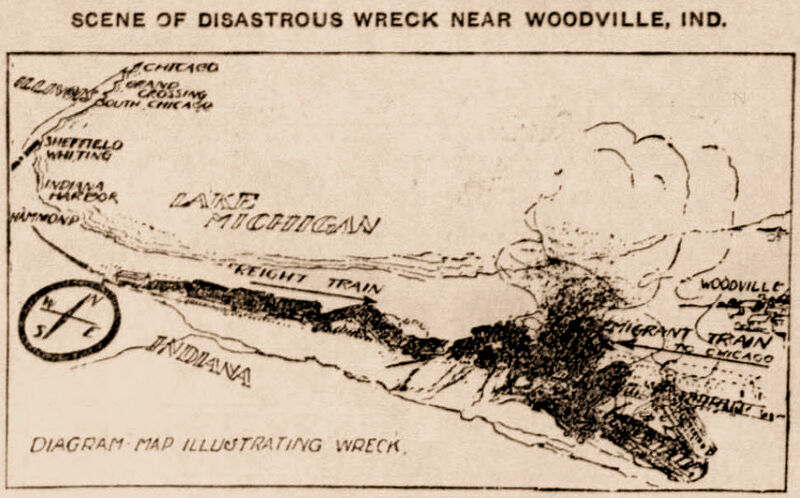 Newspaper illustration of wreck at Woodville, Indiana. Source: Stevens Point Daily Journal, November 16, 1906, p. 2. Source: The Davenport Democrat, November 12, 1906, p. 1. This line is one of the principal trunk lines crossing the State and has a very dense traffic over a single line where the accident happened. No reasonable excuse has been given why this line could not have long since been protected by a block system. Other lines in this State having less income per mile and less dense traffic have been so protected for several years, and the Commission is strongly of the opinion that the Chicago Division of this line in this State should be immediately equipped with a substantial block system. The Commission's report notes that the B&O had generated revenue of more than $3 million on its Chicago Division in 1905, resulting in a net profit of $2 million; this yielded a net profit of $5,000 per mile of track. Essentially, the Commission's argument was that the B&O had no financial-based excuse for not installing a telegraph block system on their line. In the Commission members' opinion, the accident would have been avoided had that system been installed. As previously mentioned, the exact number of deaths resulting from the Woodville train wreck is unknown. 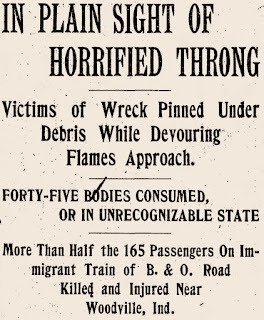 Several newspapers listing the dead from the disaster stated that their enumeration included confirmed deaths based on positive identification, as well as those individuals known to be on the train but could not be accounted for after the wreck, which represented the majority of the deaths. Several accounts noted that 45 bodies were consumed by flames and were so badly burned that identification was impossible. Interestingly, this number is greater than the 44 dead noted in the Railroad Commission of Indiana's official report. Headline of story questioning official number dead from Woodville wreck. Source: The Fort Wayne Journal-Gazette, November 14, 1906, p. 1. 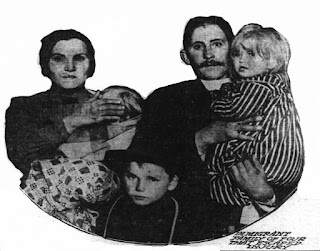 Large crowds of Russian and Polish relatives of the victims gathered at the Chicago railroad station anxious to receive news of the wreck and, hopefully, connect with their relatives as they were being brought to the city's Mercy Hospital. The crowd became agitated at one point and attacked the station's police, whose uniforms led them to believe that they were employed by the B&O. Note that several newspapers reported that all the individuals that perished at the Woodville wreck were buried at Chesterton with the exception of the Raymond E. Cullers, engineer of the freight train. Given that the vast majority of the passengers on the train were Roman Catholic, it is assumed that all the dead were buried at Chesterton's St. Patrick's Cemetery. Chicago, Ill., Nov. 22. -- Some three hundred relatives and friends of the dead victims of the Woodville wreck on the Baltimore and Ohio road, in which about one hundred people were killed, left this city on a special train today for Chesterton, Ind., to attend the funeral services over the victims. The remains of all have been exhumed from the railroad ditch where they were temporarily buried, and will be given religious burial in consecrated ground. Three bishops were in the party going from here. The Polish alliance of the Polish Roman Catholic Church Union, the Russian Revolutionary Bund and the Orthodox Jewish Rabbinical Association have already taken steps for the disinterment of the bodies buried by Superintendent Batchelders order, an investigation of the number of victims and religious burials for the dead. Indeed, a Requiem High Mass took place at St. Patrick's Church at 10:00 am on November 22 for the victims of the B&O wreck. The Reverend Father Urban Raszkiewicz, of St. Mary's Catholic Church at Otis in LaPorte County, Indiana, presided over the Mass. Other ministers attending the Mass were the Very Reverend John J. Kosinski, President of St. Stanislaus College in Chicago, Reverends Andrew Spetz and L. Szczypta of Chicago, and Reverend John E. Berg of Whiting. Unnoticed by the others, an elderly woman, bowed by grief, turned and passed again among the graves, as if attempting to ascertain which held the body of her child, then fell on her knees and kissed the ground covering her dear one, while the others moved away and left her alone with her sorrow. Many similar scenes showing the deep-rooted love of their kind among the immigrants were enacted during the journey and at the church. Below are the names of 48 individuals that reportedly perished in the wreck. Note that newspapers published various spellings of names. Thus, we provide alternative spellings in this list. A total of 81 passengers have been identified as being injured in the Woodville wreck. 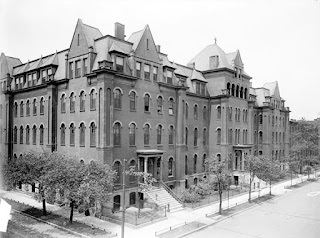 Severely injured travelers were treated at homes located in the Woodville area by physicians gathered from the region; the severely injured, identified with a (s), were later transported to Chicago. Travelers experiencing minor injuries that did not demand immediate medical attention were taken directly to Chicago from the scene of the wreck and are marked (m) for minor injury. Similar to the list of dead, various spellings were provided in newspaper enumerations of the individuals injured as a result of the wreck. where most of the injured were taken following the Woodville wreck. Source: Chicago Daily News file photograph, U.S. Library of Congress. After investigation, the Railroad Commission of Indiana determined that engineer of the first section of passenger train No. 47, Frank P. Galnouer, was responsible for the wreck. In fact, Galnouer testified before the Commission, Porter County Coroner Carson, and Porter County Prosecutor Frank B. Parks admitting that he disregarded signals on the night of November 12 and was to blame for collision at Woodville. Coming as a climax to a series of small surprises, the confession of engineer Galnauer [Sic, Galnouer] to the railroad commissioners that he had disregarded signals was dramatic. Other trainmen had told of the storm that raged the night of the wreck and the difficulty because of the wind and snow to hear or see signals distinctly. Galnauer's fireman and conductor had testified that their signals were burning as they passed the freight on the siding at Woodville [this should be the siding at Babcock], and the usual signal blasts on the whistle had been given, not only once but three times because of the noise of the elements. Then came Galnauer's admission that he had proceeded without hearing any answer to his signals. "I am poor but I am honest," he began, and every eye in the [Porter County] courtroom was immediately fastened on him. "I gave a long and two short blasts on my whistle to notify the freight that another section of my train was coming, but I did not get any answer. I thought that perhaps the wind had drowned out the response. We were traveling from forty to fifty miles per hour and were behind time. To stop would mean more delay and the possibility of the second section overtaking us. I signaled again as we swept past and listened intently for an answer. I heard nothing, but I went on." "The green lights on my engine were not burning. They had been extinguished by the wind. I depended, however, on the freight crew hearing my whistle, yet I knew they had made no response. I should have stopped. It was my duty. I knew this at the time, and yet I went on." Galnauer could go no further. Sobs drowned his words and he shook violently. Tears streamed from his eyes and the Railroad Commission, relieved the tension of the situation by saying the engineer might be excused. Convulsed with sobs, he left the room on the arm of a fellow trainman. Two hours after Galnouer's testimony to the Railroad Commission, he testified before the Porter County Coroner and Porter County Prosecutor. Coroner Carson then ordered Galnouer's arrest, as well as the arrests of Samuel J. Moste and Daniel Woodward, B&O employees on freight train No. 98. Moste and Woodward were arrested because of conflicting testimony as to whether they had heard the signal whistles from the Galnouer's passenger train as it traveled by them at Babcock. Following their arrest, the three men were taken before the justice of the peace and held on $1,000 bail pending action of the Porter County grand jury. A charge of involuntary manslaughter was placed against each man. A Porter County grand jury convened on January 3, 1907, and began their investigation of the Woodville wreck - gathering evidence and taking testimony. By the end of the month the grand jury had indicted four men with manslaughter. These men included passenger train No. 47's first section engineer Frank P. Galnouer, freight train No. 98's conductor Samuel J. Moste, passenger train No. 47's first section conductor John B. Porter, and passenger train No. 47's first section engineer Anthony Burke. Each of the four men were placed under $5,000 bond and were released upon their bond payment. Valparaiso attorney Daniel E. Kelly was retained to defend Burke, Galnouer, Moste, and Porter. The state's prosecution team included Daniel E. Boone of Hammond, Henry Colerick of Fort Wayne, and Valparaiso's Frank B. Parks. Lake County Circuit Court Judge Willis C. McMahan was appointed to preside over the trial at the court house in Valparaiso. On the 12th day of November, 1906, Frank Galnouer, a locomotive engineer, running and controlling and in charge of a certain locomotive engine which was drawing a train of cars upon the Baltimore & Ohio railroad through the county of Porter, was in the service of said railroad; that the railroad had established for the guidance of its locomotive engineers proper and sufficient rule prescribing the duties of all engineers. That said Frank Galnouer feloniously and willfully and with gross carelessness and unlawfully disregarding his duty in that behalf, failed, neglected and refused to signal a freight train standing on a sidetrack, known as Babcock siding, that his train was running in two sections, when it was his duty to do the same; and those in charge of the freight train standing on the sidetrack having no notice or knowledge that any other train was coming, ran their train at a high rate of speed, and the engine attached to the last named train was driven into the front on and collided with the passenger train, thereby crushing the cars thereof and igniting them, and one John Doe, whose true name to this affiant is unknown, who was a passenger lawfully on said train, was thereby unlawfully crushed, wounded and burned so that he immediately died; and the said Frank Galnouer did involuntarily and and without malice, feloniously kill and slay him, the aforesaid John Doe, whose true name to this affiant is unknown, in such cases made and provided and against the peace and dignity of the state of Indiana. After a trial that concluded at the court house on the morning of Saturday, April 13, Judge McMahon read instructions to the jury at 11:15. The jury then convened and at 1:20 pm announced that they had reached a verdict. We, the jury, find the defendant not guilty. John Brummitt, foreman. The cases against the other three men were then nolle prossed (dismissed) by the judge. It was reported that "verdict was received with cheers by a large audience." Why the cheers? It is suspected that most observers of the case felt that Galnouer was not entirely to blame for the wreck. Rather, it was generally believed that the B&O should have been held responsible for its failure to install telegraph block devices that would have, more than likely, prevented such a disaster. It was also very widely reported that the B&O had essentially abandoned the four men. Each of the men had to hire their own defense and certain employees of the B&O could not be found when they were scheduled to testify at trial. This behavior of the railroad company likely did not curry favor among those directly affected by the wreck, the general population, or the jurors of the case. Sympathy for Galnouer likely swayed the jurors' decision. Hence, the positive reaction in the court room to the not guilty verdict. Recall that the engineer of the second section of passenger train No. 47 that slammed into oncoming freight train No. 98 at Woodville, Charles Franklin Reneman, survived the wreck. In an ironic and coincidental twist of fate, however, he was instantly killed nearly six years later on October 10, 1912, when his passenger train No. 14 collided with freight train No. 88 at the B&O's west yard at Chicago Junction (now Willard) located in Huron County, Ohio. Similar to the Woodville disaster, the engineer of the freight train pulled his train from a siding onto the main line. Reneman could not see any danger due to dense fog and his passenger train slammed into the back end of the freight train at 60 miles per hour. Reneman was unable to cheat death a second time. Sadly, this was the second fatality in the Reneman family caused by a B&O railroad accident. 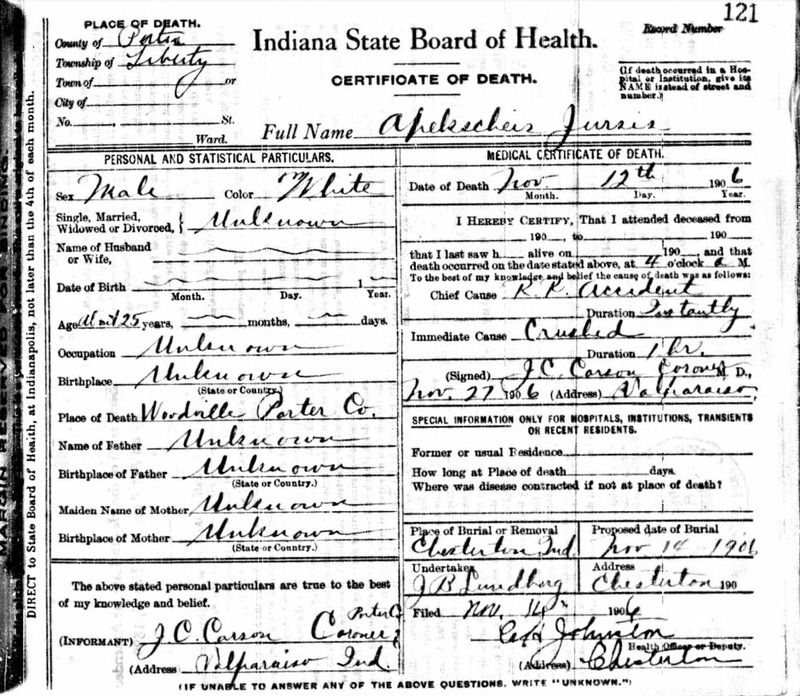 On March 28, 1900, John H. Reneman, Charles' brother and also a locomotive engineer, was killed when his passenger train collided with a freight train at Whiting in Lake County, Indiana. John's locomotive was thrown into a ditch and he was crushed and died instantly. He was operating passenger train No. 14, the identical passenger train number that his brother Charles was operating when he was killed twelve years later. One year ago today, the 12th of this month, occurred the deplorable wreck here in which sixty-three lives were lost, fifty-nine of the victims being cremated. When one calls to mind the pitiful sights on that awful morning it makes him shudder. The aggregate loss to the B. & O. by reason of this wreck was a million dollars. Engine No. 1549, which hauled the ill-fated train has had its ups and downs, having been in eights wrecks in two years. Quite recently it ran off the derail at Millers and is in the repair shop at Garrett at this time. 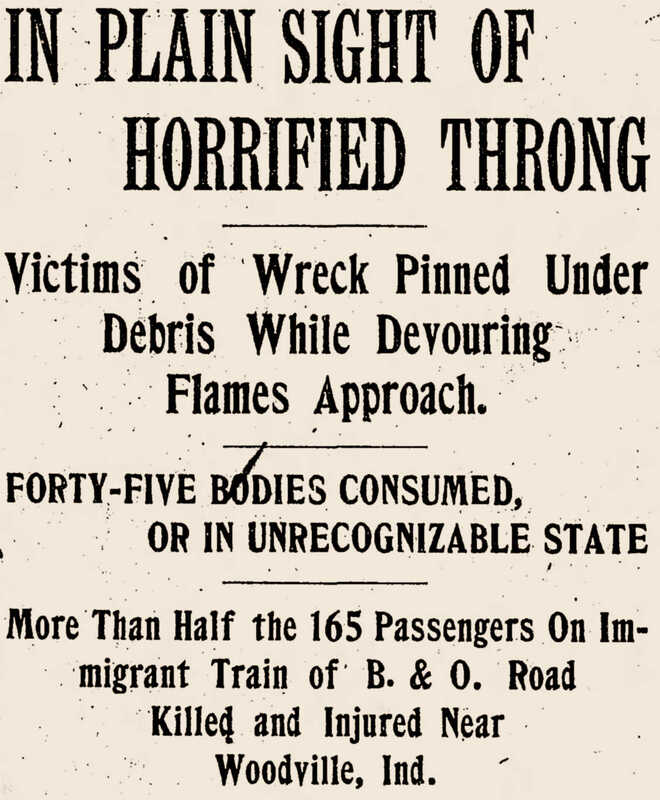 This week Tuesday marked the first anniversary of the terrible wreck on the Baltimore & Ohio railroad at Woodville, which occurred a few minutes after 3 o'clock on the morning of November 12, 1906, when between sixty and seventy souls went to their doom. A remarkable similarity of the weather conditions on the first anniversary of the catastrophy [sic] and the day of the appalling calamity took place was noted Tuesday, the snow falling in great sombre flakes as it did on that fateful morning a year ago. No observance was made in Chesterton, the wind alone moaning and whistling a creepy requiem over the graves of the mangled and charred victims of the wreck. Given the magnitude of the Woodville disaster, it is rather remarkable that there is no memorial or historical plaque noting the wreck and commemorating those individuals that died. Nor is there any indication by marker or memorial of a mass grave at Chesterton's St. Patrick's Cemetery, where nearly every victim that could be retrieved from the accident site was interred. The Woodville train wreck, by far Porter County's most significant disaster, appears to be lost to history. Anonymous. 1907. Report of the Indiana Railroad Commission on Recent Accidents. Railway Age 43(10):312. Shaw, Robert B., Ralph S. Podas, John H. White, Jr., Karl A. Roider, H. Roger Grant, and Mark Reutter. 2001. A History of Wrecks. Railroad History 184:20-77. The Sun, Baltimore, Maryland; September 24, 1863; Volume 53, Number 111, Page 4, Column 2. Column titled "Monetary and Commercial." The Sun, Baltimore, Maryland; September 26, 1863; Volume 53, Number 113, Page 1, Column 7. Column titled "Funeral of the Late Wm. Woodville." Porter County Vidette, Valparaiso, Porter County, Indiana; December 31, 1874; Volume 18, Number 53, Page 3, Column 5. Column titled "Liberty Township Items." Porter County Vidette, Valparaiso, Porter County, Indiana; January 21, 1875; Volume 19, Number 3, Page 3, Column 4. Column titled "Suman Station, on the B. & O. R. R.."
Fort Wayne Daily News, Fort Wayne, Allen County, Indiana; March 29, 1900; Volume 26, Page 8, Column 1. Column titled "Bad Wreck on the B. & O." The Buffalo Enquirer, Buffalo, Erie County, New York; November 12, 1906; Volume 63, Number 90, Page 1, Columns 1-2. Column titled "Big Wreck of Passenger and Freight Trains on the Baltimore & Ohio Railroad and Then Fire!" The Davenport Democrat, Davenport, Scott County, Iowa; November 12, 1906; Volume 52, Number 21, Page 1, Columns 3-4. Column titled "Terrible Holocaust on the Baltimore and Ohio Railway." The Garrett Weekly Clipper, Garrett, DeKalb County, Indiana; November 13, 1902; Volume 18, Number 4, Page 5, Column 3. Column titled "Local and Personal." Atlanta Constitution, Atlanta, Fulton County, Georgia; November 13, 1906; Volume 39, Number 151, Page 1, Column 1. Column titled "47 Killed by Collision of Trains 38 Hurt." The Chicago Daily Tribune, Chicago, Cook County, Illinois; November 13, 1906; Volume 65, Number 272, Page 1, Column 7 and Page 2, Column 1-5 and Page 3, Columns 2-6. Column titled "Placing Blame for Wreck that Ended 50 Lives." The Chillicothe Constitution, Chillicothe, Clark County, Ohio; November 13, 1906; Volume 18, Number 21, Page 2, Column 4. Column titled "40 Die in Wreck. Disastrous Collision in Indiana." Fairbanks Evening News, Fairbanks, Fairbanks County, Alaska; November 13, 1906; Volume 2, Number 185, Page 1, Columns 2-6. Column titled "Many Emigrants Burned. 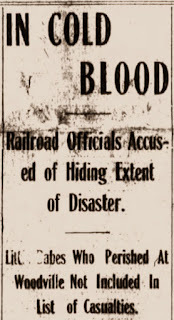 Railroad Accident on the Baltimore & Ohio Results in the Death of 47 Persons." The Inter Ocean, Chicago, Cook County, Illinois; November 13, 1906; Volume 35, Number 234, Page 1, Column 7 and Page 3, Columns 2-6. Column titled 50 Killed and 46 Hurt in Train Crash Near Chicago." Los Angeles Herald, Los Angeles, Los Angeles County, California; November 13, 1906; Volume 34, Number 43, Page 1, Column 7 and Page 2, Column 2. Column titled "Flames Destroy Bodies. Forty-Seven Perish in Terrible Wreck. Catastrophe in Indiana One of the Worst on Record." The Manchester Guardian, Manchester, England; November 13, 1906; Number 18,803, Page 7, Column 3. Column titled "Railway Smash. American Train Wrecked and Burned." The Nashville American, Nashville, Davidson County, Tennessee; November 13, 1906; Volume 33, Number 11215, Page 1, Columns 6-7. Column titled "In Plain Sight of Horrified Throng." The Daily Journal, Freeport, Stephenson County, Illinois; November 14, 1906; Volume 28, Number 115; Page 2, Columns 1-2. Column titled "How Many are Dead? Probably Never Will Be Known as to the Wreck on the Baltimore and Ohio Road." Evening Herald, Huntington, Huntington County, Indiana; November 14, 1906; Volume 22, Number 272, Page 3, Column 2-3. Column titled "How Many are Dead? Probably Never Will Be Known as to the Wreck on the Baltimore and Ohio Road." The Fort Wayne Journal-Gazette, Fort Wayne, Allen County, Indiana; November 14, 1906; Page 1, Column 4 and Page 5, Columns 1-2. Column titled "In Cold Blood. Railroad Officials Accused of Hiding Extent of Disaster." The Richmond Palladium, Richmond, Wayne County, Indiana; November 14, 1906; Volume 31, Number 289, Page 1, column 1 and Page 2, Column 2. Column titled "Loss of Life May Reach a Hundred: Arrests Likely." The Scioto Gazette, Chillicothe, Ross County, Ohio; November 14, 1906; Volume 28, Number 131, Page 1, Column 1. Column titled "The Fifty-First Man Dies." Stevens Point Daily Journal, Stevens Point, Portage County, Wisconsin; November 14, 1906; Volume 12, Number 3434, Page 2, Column 1. Column titled "Blame for Wreck Hard to Locate." The Chesterton Tribune, Chesterton, Porter County, Indiana; November 15, 1906; Volume 23, Number 33, Page 1, Columns 3-6. Column titled "Woodville's Awful Horror Shocks the Entire Country." The Chesterton Tribune, Chesterton, Porter County, Indiana; November 15, 1906; Volume 23, Number 33, Page 1, Columns 4-5. Column titled "A Head-on Collision on the B. & O. Railway Destroys Passenger Train Filled with Immigrants." The Chesterton Tribune, Chesterton, Porter County, Indiana; November 15, 1906; Volume 23, Number 33, Page 2, Columns 5-6. Column titled "Fifty Immigrants Killed in Wreck." The Chicago Daily Tribune, Chicago, Cook County, Illinois; November 18, 1906; Section III, Page 8. Full page advertisement for the Electric Signagraph and Semaphore Company." The Chesterton Tribune, Chesterton, Porter County, Indiana; November 22, 1906; Volume 23, Number 34, Page 2, Column 4. Column titled "Wreck Victims Number 59." The Chesterton Tribune, Chesterton, Porter County, Indiana; November 22, 1906; Volume 23, Number 34, Page 5, Column 4. Column titled "Engineer Ganauer Held. Breaks Down and Weeps Like a Child When Coroner Carson Announces His Decision." The Chesterton Tribune, Chesterton, Porter County, Indiana; November 22, 1906; Volume 23, Number 34, Page 5, Column 6. Column titled "Local News of the Week." The Chesterton Tribune, Chesterton, Porter County, Indiana; November 22, 1906; Volume 23, Number 34, Page 8, Column 4. Column titled "Woodville. Notes from the Wreckage." The Indianapolis News, Indianapolis, Marion County, Indiana; November 22, 1906; Volume 37, Number 301, Page 4, Columns 2-3. Column titled "Dramatic Scene At Wreck Inquiry." Palestine Daily Herald, Palestine, Anderson County, Texas; November 22, 1906; Volume 5, Number 112, Page 1, Column 3. Column titled "Victims of Wreck Will Be Buried." The Inter Ocean, Chicago, Cook County, Illinois; November 23, 1906; Volume 35, Number 224, Page 10, Column 2. Column titled "Mourn for Wreck Victims. Relatives of Woodville Dead Visit Graves. Priests Chant Solemn Requiem for Dead and Pathos Marks Scenes in Village Churchyard." The Chesterton Tribune, Chesterton, Porter County, Indiana; November 29, 1906; Volume 23, Number 35, Page 1, Column 6. Column titled "Blames Road for Wreck. Coroner at Woodville, Ind., Censures Baltimore & Ohio." The Chesterton Tribune, Chesterton, Porter County, Indiana; December 13, 1906; Volume 23, Number 37, Page 3, Column 5. Column titled "Local News of the Week." The Chesterton Tribune, Chesterton, Porter County, Indiana; December 20, 1906; Volume 23, Number 37, Page 3, Column 6. Column titled "Local News of the Week." Albuquerque Morning Journal, Albuquerque, Bernalillo County, New Mexico; January 30, 1907; Volume 29, Page 2, Column 1. Column titled "Investigating Indiana Horror." The Garrett Weekly Clipper, Garrett, DeKalb County, Indiana; January 31, 1907; Volume 12, Number 15, Page 1, Column 6. Column titled "Four Are Indicted. By Grand Jury For Responsibility in Woodville Wreck." The Lake County Times, Hammond, Lake County, Indiana; April 6, 1907; Volume 1, Number 247, Page 1, Column 1. Column titled "Wreck Trial Starts Monday." The Lake County Times, Hammond, Lake County, Indiana; April 9, 1907; Volume 1, Number 249, Page 1, Column 1. Column titled "Ask Change of Venue." The Evening Republican, Columbus, Bartholomew County, Indiana; April 15, 1907; Page 3, Column 2. Column titled "Engineer Acquitted. Jury Held Galnoure Guiltless of Responsibility for Woodville Horror." The Chesterton Tribune, Chesterton, Porter County, Indiana; April 18, 1907; Volume 24, Number 3, Page 1, Columns 3-4 and Page 4, Column 8. Column titled "Galnouer A Free Man." The Chesterton Tribune, Chesterton, Porter County, Indiana; November 14, 1907; Volume 24, Number 33, Page 4, Column 2. Column titled "Woodville." The Chesterton Tribune, Chesterton, Porter County, Indiana; November 14, 1907; Volume 24, Number 33, Page 5, Column 6. Column titled "An Anniversary." The Garrett Weekly Clipper, Garrett, DeKalb County, Indiana; October 17, 1912; Volume 27, Number 51, Page 1, Column 3 and Page 4, Columns 2-3. Column titled "Garrett Men Die In Wreck." The Vidette-Messenger, Valparaiso, Porter County, Indiana; June 1, 1956; Volume 29, Number 280, Page 1, Column 5 and Page 6, Column 2. Column titled "Woodville Train Crash Is Recalled," by The Stroller (William Ormand Wallace). Very well written and comprehensive article. Wish they would put up some sort of market/memorial in honor of all who perished. I have a glass negative of this wreck. Hi, Steve. That's a great pic of you. I live at 190 E 900 N now, so technically I think I'm in Woodville. There is only one original home still standing. There is no way to adequately thank you for all of the work you do. You are saving history for Porter County. Would love to have a conversation some day if you come to town. Hello Connie! Thanks for the kind remarks. I hope to be in the region within the next six months to visit family. Hope all is well with you and your family. Thank you for a short History lesson. I really enjoyed it. I had a relative die in a train crash with a milk truck in Valparaiso so this really hit home. I too think the area should be marked some way so it could be remembered. That was a lot of loss lives. Thank you again.